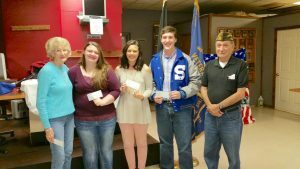 Pictured left to right are Marge Wright, Scholarship Chairperson, 1st place winner Robyn Wilson (Home School); 2nd place Mariana Larsoon; 3rd place Sean Widener (both of Shirley School) and Roy Madrid, VFW Commander. Not pictured is the 4th place winner, Seth Connell (Home School). We are so proud of these students and wish them the best in their future.